Cooking Traditional Food Class with Nazlina in Penang. Hi there, you have made the right choice to check out the most enjoyable and educational half-day market tour and cooking class in George Town! Nazlina Spice Station, No. 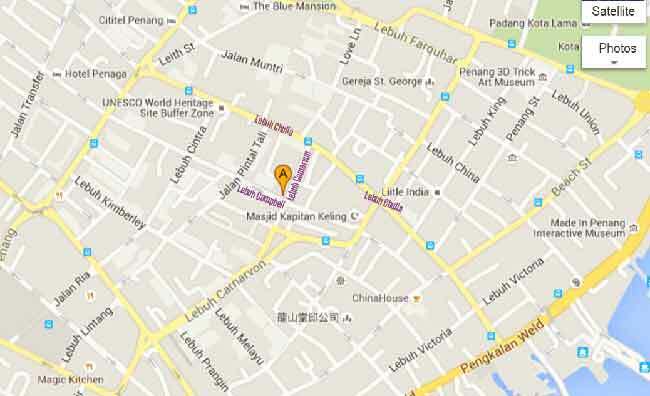 2, Campbell Street, 10100 George Town, Penang, Malaysia. We have provided what we hope to be very helpful information to assist you in booking with us for our Cooking Classes. If there is anything else you would like to know that isn't clear to you, please let us know by asking your questions in the query box at the end of this page. Thank you. for the ASEAN gastronomy forum). *No classes available from 25th to 29th April 2019 (Nazlina will be in Johor Bharu for a dragon boat race). *No classes available from 30th May to 18th June 2019 (Nazlina will be in Hong Kong for a dragon boat race as well as a short holiday to the USA). We are on the corner of Campbell and Carnarvon Street in front of Campbell Street Market - Please refer to the map below for directions. If you need to take a taxi to reach us, we find that Uber or Grab are the cheapest. We can provide a return transfer service from your hotel at an added price per person. Please tell your taxi driver that we are opposite the entrance to Campbell Street Market. They should be able to find us easily then. If you still struggle to find us, Google Maps or your equivalent, and Facebook can pinpoint our location precisely; Google Nazlina Spice Station, Nazlina's Cooking Class and Penang Cooking Class for directions also. Please Note: Our classes are extremely popular and we ask you to give us as much notice as you can. We are often unable to assist you with last minute or next day bookings unless we have a cancellation. Please be aware that to avoid disappointment, book at least 1-2 weeks in advance. Thank you. Classes are available on Monday, Tuesday, Thursday and Friday each week, and start at 8.00am. If these days don't suit you, we may consider others days by Special Booking Appointment. Please contact us for more details. We also offer a vegan/vegetarian class in the afternoon which starts at 2.30pm. Classes usually run no later than 12.30pm (5.30pm for the afternoon vegan/vegetarian classes) and we make a minimum of four items in each session, sometimes five items. Some items are more simple to make, some take longer than others. Nazlina will decide what is appropriate, given the time and resources that we have on the day. Please Note; We make 4 to 5 items including dessert per session for RM250 inclusive per person, and we assure you that this is a truly value for money experience. We are unable to give any discounts so please be aware of this. We can however personalize your session if your group is 12 people or more for a team building experience. Please text or WhatsApp your query/reservation including name and email address to Nazlina at +6012 - 4538167. More questions can be forwarded through the booking form below. Thank you. Please Note: By reservation only. Please indicate in the contact form which session you prefer. The menus for April 2019 - September 2019 are listed below. For future months, they will be announced as the date is nearer. Don't forget, you can now book your copies of the new book The Fierce Aunty's No-nonsense Guide to the Perfect Laksa (RM88 per copy) on the booking form below. Also, you can book your Recipe Card Pack (RM20 per set) here too. Paypal - nazlina.hussin @ gmail.com (Please ensure the transaction cost is covered (about 5% for Paypal). Bank transfer - Maybank2u.com.my online payment or a cash deposit machine. Details about each payment method will be emailed accordingly. We look forward to seeing you all very soon for a wonderful cooking experience. Please Note: Even though the menus are advertised here, they are not set in stone. They are flexible.You can request in advance or when we meet up at breakfast. We will let you know if it is possible to cook the menu of your choice and we try to be as flexible as possible in every session. Having said that, menus are designed in such a way that the items complement each other. So, for example, I don't make chicken curry laksa served with noodles nor Malay chicken curry served with rice. **Please indicate food allergy or dietary requirement when filling up the booking form below**. On 3rd March 2018, we are organizing a lovely tour to an organic rice farm. You are most welcome to join too. Fun photos of the cooking class here!